As the perfect brand for gentlemen racers, Aston Martin is every year at the Nurburgring 24 hours race, but there will be something new and unexpected this year. It will be a Rapide competing, the four-door Aston Martin, and it will run with two fuels. Gasoline and hydrogen. The big V12 can run with either fuel, or a mixture of the two. There are no more technical details yet, but it’s understood that the engine makes less power when on hydrogen. So much less that a turbocharger was added. 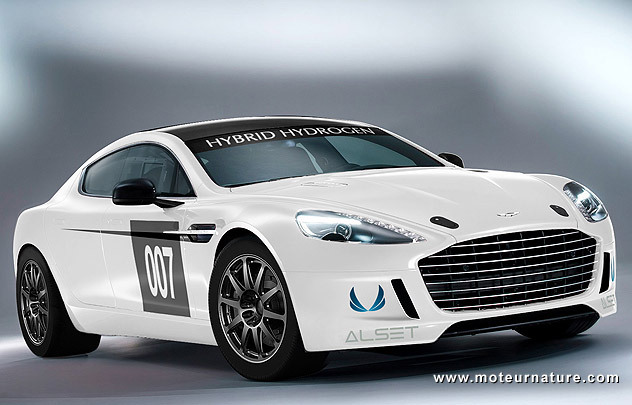 There are four hydrogen tanks to store nearly 8 pounds of gaseous hydrogen at 5000 psi and, depending of the driver, whether he wants the maximum power of the fewer CO2 emissions, the Aston Martin Rapide will race with more gas or more hydrogen.